1. Heat oil in a wok over medium heat and add the red curry paste, stir well. Then add 3/4 cups coconut milk and stir until mixed thoroughly. 2. Add the roasted duck and stir often. 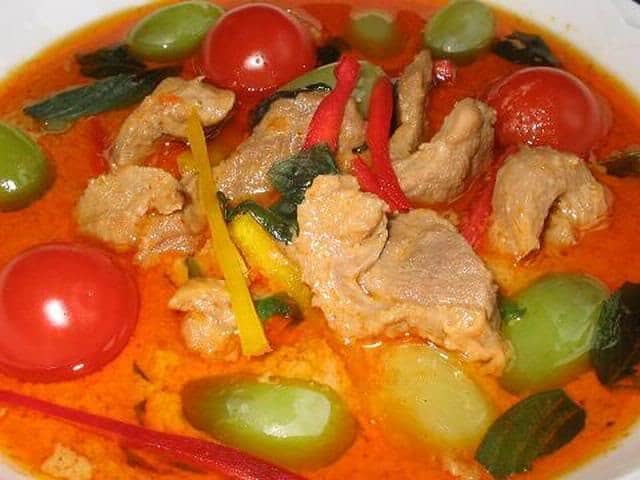 Then pour the mixture into a pot, add the remaining coconut milk, water, tomatoes, pineapples, eggplants, kaffir lime leaves, sugar, salt, and fish sauce. 3. Continue stirring until boiling and remove from heat. Transfer to a serving bowl.